I’m going to put this right out there – my backyard is a mess! Its size (HUGE) helped sell the house, but beyond that it’s pitiful. After I bought the house the weather got too hot to work outside, so it’s just been sitting in misery for 6 months. 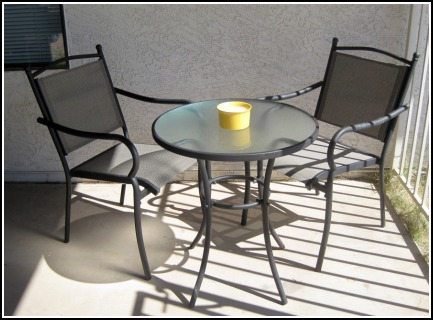 Now that the weather is cooling down (below 100 degrees is considered “cooling down” around here) it’s time to start putting a little effort into the backyard! Expect to see a lot of outdoor projects in the upcoming months. Let’s start with a place to sit. 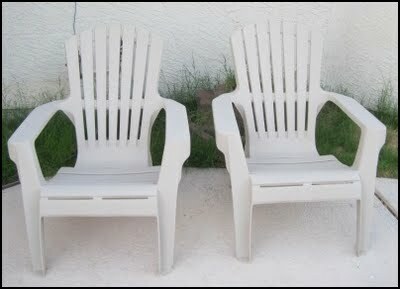 If you’ve been following since June you’ll remember these Adirondack chairs I bought at the thrift store for $8/each. ﻿Fast forward almost 4 months later and that’s still the only furniture I have outside. Shameful, I know. 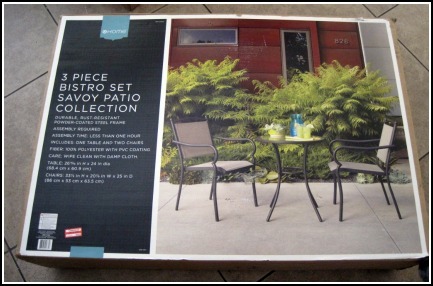 Well, a couple months ago I was wandering around Target’s garden department and found the perfect bistro set. It was on clearance for $69.99 (originally $99.99). So I said to myself, “Self, why don’t I cash in my credit card points for a $50 Target gift card? Then this will only cost me $20 oop (out of pocket).” And that’s what I did. A couple weeks later, gift card in hand I went back to Target. There were 3 sets left and they were still $69.99, so I decided to risk it and hold off another couple weeks hoping they’d be clearanced even more. 2 weeks later I went back and they were marked $49.99! With my gift card I only paid tax oop! Assembly time! I’m proud to say I put the whole set together all by my onesies (while my boyfriend watched football)! And here it is! Complete with a citronella candle to keep the bug bites away! Nothing groundbreaking, but it’s a start! I love the new blog look! It's awesome! And the updates on your Home Tour page. Nice buy,if you can call it that Sam!! LOL. Way to rock a bargain. 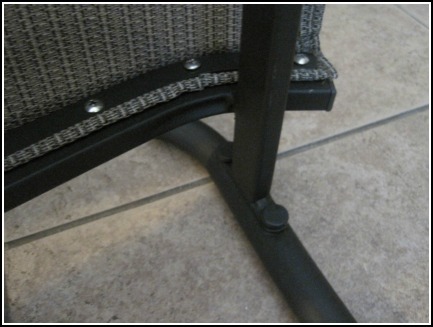 Personally, if all you ever have is a couple of adis and a little table in between, you'd probably be good to go. I live in mine.